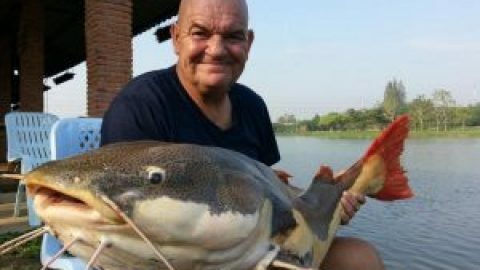 The second day of a two day Giant Stingray fishing trip at the Mae Klong River in Thailand saw the Fishsiam team once again placing a series if baits at intervals across the tidal river. After catching only one stingray on the previous day of fishing the team were eager to produce more stingrays for the camera crew. It was not long before one of the baits was picked up by a small stingray which was unceremoniously winched up through the depths on the heavy duty stingray fishing outfit. The Giant freshwater stingray only weighing approximately 20kg had been totally out gunned by the heavy duty outfit used by the team and was soon released back into the tidal river. With the tide looking perfect fir more stingrays it wasnt long before the team were once again attached to another freshwater stingray. The fish on this occasion was clearly a bigger fish which proceeded to clamp onto the bottom on several occasions before it was finally brought through the depths to the waiting net. On inspection the Giant freshwater stingray was estimated to weigh 40kg and was released after a short examination by scientists from Chulalongkorn University in Bangkok. With still a few hours left, baits were once again dispatched to the depths in the hope of a much bigger stingray taking one of the baits. After almost an hour of inactivity one of the baits fished on a wide section of the tidal river was picked up. On this occasion from the very beginning it was clear that this stingray was much bigger as it proceeded to tow the boat downstream. Maximum pressure was applied from directly above the fish by the Japanese angler in an effort to shift the Giant freshwater stingray from its underwater lair. After several minutes of arm aching pressure being applied to the stingray it pulled off the bottom and embarked on another unstoppable run down stream. Once again the fishing boat was moved into a different position and pressure was reapplied again. The battle continued for almost an hour with the angler bringing the stingray into the middle layers of the river several times only for it to dive back down to the bottom. With the battle now past the hour point the anglers continued to pull for their worth placing as much pressure as humanly possible on the stingray from above. Suddenly the Giant freshwater stingray released its grip on the bottom causing the tip of the 130lb class rod to spring back. The angler quickly replaced several yards of line onto the reel and let the heavy duty stand up rod take the weight of the unseen monster stingray. Slowly the Giant freshwater stingray was winched through the middle layers towards the waiting net attached to the side of the boat. 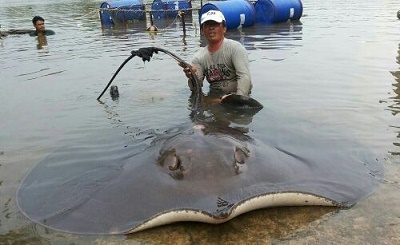 As the prehistoric stingray broke the waters surface it angrily whipped its tail as it was engulfed by the net. The tail and barb were quickly made safe with a bandage before the fish was transported to the riverside. On arrival at the riverside the stingray was quickly examined by the scientists before being hoisted up onto a custom made weighing rig with heavy duty digital scales. An accurate weight if 190kg’s was recorded and measurements of 1.70m in width with a length of 3.40m.